Our second, sighted window watcher on Jan. 16, 2018 follows-up Seer (my nickname), along with 10 others since the series started in October 2016: Charm, Cool, Curious, Glass, Kit, Seeker, Star, Still, Twain, and Watcher. Another, Burglar, climbs into one. The house next to the American Market, on Cleveland Ave., is a recent renovation and subsequent rental. 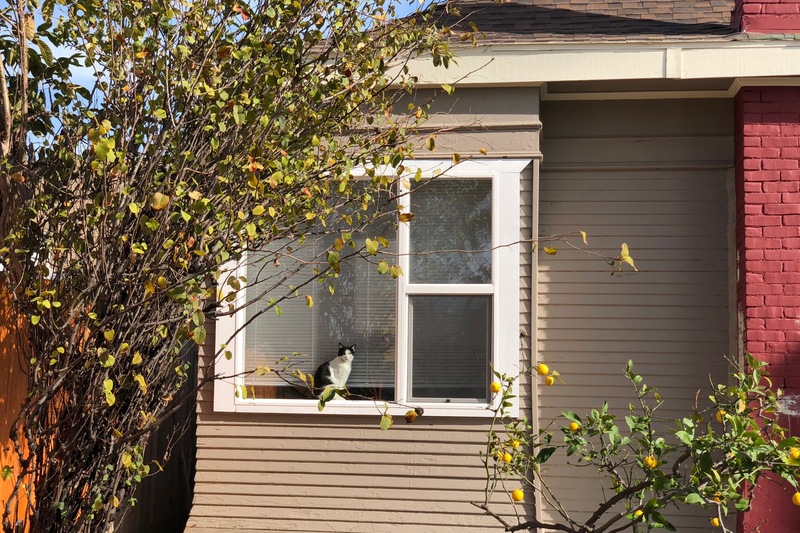 I dub the kitty in the Featured Image Fresh, for being a neighborhood newcomer. Hehe, she also looks out on freshly growing oranges. I captured the portrait, while walking home with groceries, using the iPhone X second lens to 2X zoom. Vitals: f/2.4, ISO 16, 1/706 sec, 6mm; 1:12 p.m. PST. Some background: Park Blvd. divides University Heights in so-called East and West subdivisions. I saw Seer on Mississippi Street in UHE. Cleveland Ave. is one of the two main thoroughfares through UHW; adjacent and parallel Maryland is the other. Besides being found looking out windows in different parts of the neighborhood on the same day, Fresh and Seer share B&W color combination, just rendered differently. From the archives: Scruffy, Roly Poly, Woo, Skull, Biscuit, The Colonel, White, Chipper, Frisky, Stretch, Needy, Farfisa, Mates, Hunter, Pee-Pee, Blue, Blue Too, Bonded Pair, Patience, Fess, Jumper, Frenemy, Looker, Cozy, Scout, Lurks, Skit, Mini, Betty, Black and White, Stalker, Bell, Chill, Sammy, Scratch, Poser, Star, Grey and White, Watcher, Herman, Comet, Roman, Willow, Chub, Nimbus, Watson, Lilo, Kit, Pepe, Twilight, Sebastian, Spot, Booger, Ash, Veruca, Riley, Mellow, Bonde, Flower, Glass, Black, BeBe, Fang, Bruce, Siamese, Pounce, Tortie, Haiku, Fraidy, Peso, Daniel Tiger, Dusk, Stride, Dainty, Spry,Tabby, Betty Too, Still, Levi, Shadow, Sophie, Wink, Ferals, Momma, Charlie, Tux, Cool, Benny, Jellicle, Itchy Valentino, Goldie, Nine, Amanda, Siesta, ChaCho, Charlie, Too, Mika, Crystal, Seeker, Mittens, Dancer, Smokey, Monkey, Captain Blackbeard, Season, Maven, Tink, Chunk, Curious, Hanoi, Bella, Tarry, Guido, Maxine, Mr. Kitty, Peohe, Panda, Frankie, Sunshine, Twain, Willow, Too, Brawn, Reddy, Burglar, Laramie, Lupe, Bright, Tom, Charm, Buddies, Boss, Ohana, and Seer.